It can save you money and its more convenient than wood or coal. 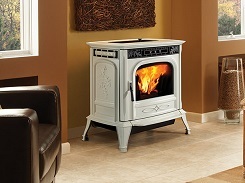 For someone committed to using a renewable energy source and who is away from home for many hours at a time, a pellet stove can be a good choice. A wood pellet stove burns processed wood — the logs have been debarked, ground, dried and then compressed into small pellets. Pellets generally are more economical than heating oil, propane or electricity, and like traditional wood, they are renewable. 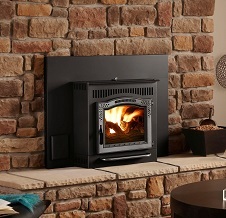 Compared with a log-burning woodstove, a pellet stove is easier to tend. You fill the hopper in the morning and get heat for 12 hours or more before you need to reload the stove. The pellets burn cleanly and efficiently. They’re also more compact and thus easier to store than logs. Pellets are generally baged in 40 pound bags making for easy carrying and loading of the pellet stove. Because pellets are made from processed wood, however, they are usually more expensive than firewood — but pellet pricing can be competitive for people who live in or near large urban areas where natural firewood can be very expensive. Fluctuations of conventional energy prices can also have a big impact on pellet prices because pellets have higher energy input than natural firewood, you can currently expect to pay about $220 to $270 for a ton of quality pellets, which provides roughly the same amount of heat as a $175 to $225 cord of wood. If you’re able to cut and split your own wood, the cost difference will be much greater, of course. When figuring the total cost of operation, investigate the cost and availability of the pellets sold in your area as well as the annual cost of electricity needed to operate the stove. One downside of wood pellet stoves is that they require electricity to feed pellets into the stove and to run fans to emit warm air, so if you get your energy from the grid, you won’t have heat if you lose power. Some models can be fitted with battery backups. 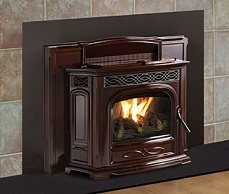 Harman Pellet Stoves and Fireplaces. Built to a standard, Not a Price.